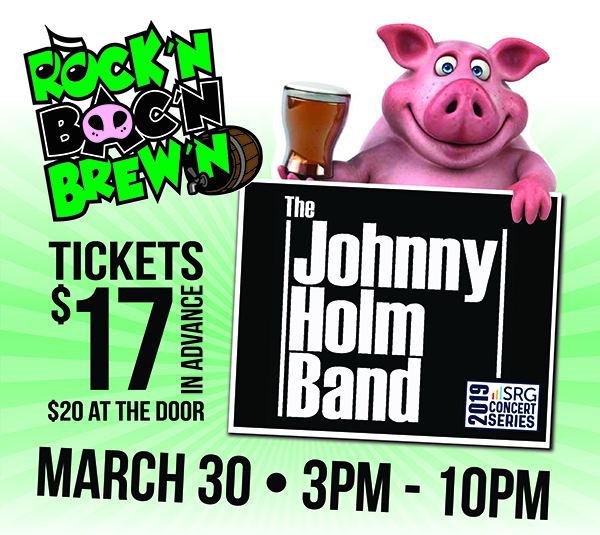 The Johnny Holm Band, one of the most widely known and traveled bands in America, dedicates their show to the fans, and they do most of the entertaining. Mostly impromptu, the show moves with the speed of lightning and changes direction as soon as "the pied piper" notices a lag. "Never a dull moment" was never a more true description. Surrounding himself with the finest musicians in the Midwest, Johnny Holm and his band rocks, picks, and thunders along for 3-4 hours, almost non-stop from the first song to the last laugh. "The Johnny Holm Band was a huge hit when they headlined here for RAGBRAI in 2017," said Fair & Events Center CEO Jeremy Parsons. "A repeat performance by this high energy band will be a great addition to Rock’n Bac’n Brew’n." In its fifth year, Rock’n, Bac’n Brew’n will again offer sampling of craft beer and bacon specialties. Sampling for the event will be from 3:00pm – 6:00pm. In addition to samples, the Iowa Beer Bus will be back serving pints from your favorite brewery, and food trucks will be on site serving up your pork-tastic favorites. The bacon-eating contest returns and the second annual stein-hoisting contest will be held from 6:00pm – 7:00pm. Tickets, which include 10 sampling choices and admission to the concert, are on sale now. Tickets are $17 in advance, $20 day of show and can be purchased at the Events Center Box Office (M-F, 9a-5p), online at www.midwestix.com, or charge by phone 515-244-2771. Rooted in Tradition, the Clay County Fair and Events Center is a year-round facility that annually hosts more than 300 events, including its signature event, the Clay County Fair. Known as "The World’s Greatest County Fair" since 1917, the Clay County Fair attracts more than 300,000 guests each September for nine-days of world-class entertainment, competition, food, fun, and the largest farm machinery show at any fair in the United States. Additional information can be found at claycountyfair.com. Clay County Regional Events Center 800 W 18th St.